Odisha CDMO Bhadrak Dist Staff Nurse Recruitment Examination 2017: Chief District Medical Officer (CDMO), Bhadrak District, Odisha has invited applications from the citizens of India for Laboratory Technician, Staff Nurse, ANM, Medical Officer and Pharmacist posts on contract basis. There are total 43 jobs available in CDMO Bhadrak District recruitment. Eligible candidates can send their applications on or before 27-12-2017. The selection for this Odisha CDMO Bhadrak Recruitment 2017 -will be made based on merit list on marks secured in the qualifications from Staff Nurse, ANM and lab technician jobs. And for pharmacist and Medical Officer jobs through walk in interview. Available Vacancies, Qualification, Pay Scale, Selection Process and other important information regarding Chief District Medical Officer (CDMO), Bhadrak District Staff Nurse, ANM, Pharmacist, Laboratory technician Jobs Notification 2017 are given below. Download here official advertisement of CDMO, Bhadrak District Staff Nurse Recruitment. Last date to send application form for Staff Nurse, LT, pharmacist and ANM Jobs is: 27-12-2017. There are total 43 vacancies available in Bhadrak District CDMO Recruitment. 1. Laboratory Technician: 07 (UR-05, ST- 01, SC- 01) posts. 2. Pharmacist: 01 (UR- 01) posts. 3. Staff Nurse: 24 (UR- 12, SC- 05, ST-07) posts. Laboratory Technician: Candidate must complete Diploma in Medical Laboratory Technology course from Institution approved by AICTE or from any three government Medical College and Hospital of the state. Pharmacist: Must complete Diploma in Pharmacy course from any Institution approved by AICTE/ Pharmacy council. For Medical Officer Jobs-MBBS or BDMS qualification is required. Attendant: Candidate must pass VII class M. E. School Certificate Examination. Candidate must have knowledge in Odia, able to read, write & speak, also be physically fit and free from physical defects. Applicant age should be more than 21 years and less than 32 years as on date of advertisement. The upper age relaxation for women, SC, ST and SEBC candidates is 5 years and for PH, Ex- Serviceman is 10 years. For Medical Officer Jobs upper age limits is 65 years. Selection for these vacancies will be on merit basis on marks obtained in Examination. Exam syllabus and Marks weight age for the posts ANM, Staff Nurse and Lab- Tech. i.HSC (Excluding 4th optional/ its equivalent): 20%. ii. +2 Science (Excluding 4th optional/ its equivalent): 30%. iii. Diploma in ANM/GNM/DMLT course: 50%. For Pharmacist, Medical Officer jobs walk in interview will be conducted. For Attendant posts candidate must pass M. E (Middle English) School Certificate Examination Class VII. Merit list will be prepared based on the marks secured in this Examination. Interested candidates who meet eligibility criteria can apply for Bhadrak dist CDMO Recruitment from official website. Fill the application in prescribed format and send along with required documents i.e. self attested copies of marks sheet, resident certificate, cast certificate etc. through registered or speed post. Last date to send application is on or before 27-12-2017. 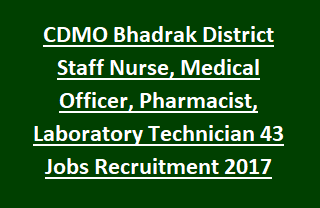 Click here to see official advertisement of CDMO, Bhadrak District Pharmacist, Staff Nurse, Laboratory Technician Recruitment.